Please see tabs (right) specs and info on bed frame and mattress. The Prime Care Essential Packages includes our premium hospital bed frame with our home care alternating pressure mattress system. The Alternating Pressure Mattress System fits easily over the hospital bed frame. It is designed to operate from an elevated position. This Essential Alternating Pressure Mattress is designed to prevent and heal up to the beginning of stage 1-2 bedsores. This Alternating Pressure Mattress is our entry level mattress into our premium brand. This hospital air mattress is ideal for patients that are recovering from a bedsore or who have developed skin break down, bruising or ulcers. 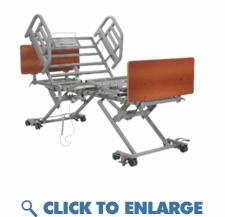 This premium hospital bed is an upgrade to most standard medical bed frames. It is equipped with all of the core features required in a long term care bed. It can convert from a standard hospital bed (35" width) to an extra wide (42" width) with an easy to install expansion kit. This expansion kit allows it to work with 42" mattress systems with the expensive added cost of a bariatric bed frame. The all steel frame is high quality and offers superior strength. 4 Function Hand Pendant Remote control. � Head deck up and down. � Foot deck up and down. � Auto Contour - raise and lower the head and foot decks at the same time. � Bed deck up and down. The wall bumper is designed to prevent damage to facility walls by keeping the head end of the bed spaced off the wall.